Recently, after commenting on the latest of Qantas’ engine troubles, I was asked to talk about what was an “interesting” in-flight moment for me. Despite this being one of the most common questions, I realised that I’ve never blogged about “interesting” flight moments – which of course immediately motivated me to do so. This particular sequence of events took place in an Airbus A300-600R, parked on the ground in Singapore, circa 1996. We were scheduled to take the aircraft to Dubai, with a midnight departure. I was the under-training First Officer, having recently joined the airline. The Captain was a wonderfully amiable and amenable Algerian, Captain Najeeb, who spoke with a lilting French accent guaranteed to make my wife swoon. Najeeb was a true gentlemen, an excellent trainer and impeccably polite at all times. Physically smaller and far more self-effacing than his student (I am almost 2 meters tall, over 100Kg and at times too boisterous for my own good). Najeeb exuded a quite confidence and a command presence. 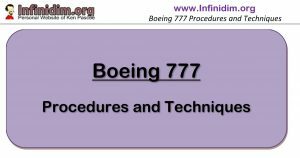 As a pilot under training, new to the Company, the operation, the aircraft, the airport – you’re aware that you’re clearly in many ways a burden to the operation, and in particular the Training Captain assigned to you. During normal operations you do your best to contribute to the operation, performing the tasks you’re been trained for, looking to see how you can forward the progress of a departure. When things go wrong – real world things, rather than the emergencies you train in the simulator for – you can become something of an impediment to resolution, but you do your best and your Trainers are patient. 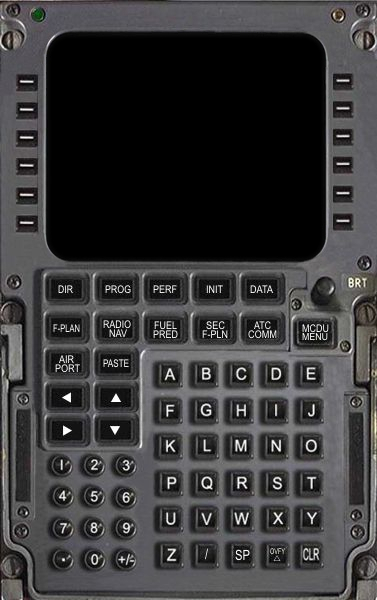 We arrived at the aircraft to find that the Control Display Unit (CDU) of the Flight Management Computer (FMC) had failed on the Captain’s side of the aircraft. 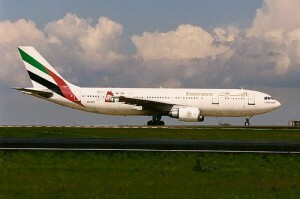 The A300 had two of these (we got one each) but only one is normally required for dispatch. However this particular flight was to depart under the far stricter rules of ETOPS (Extended Twin engine OPerationS) which basically meant that at various times during the flight we would be up to 3 hours from the nearest airport in a two engine aircraft. Maintenance requirements are higher in this case and so by those rules we required both of the CDU’s serviceable. At this point we were approximately an hour from departure. The first decision to be made was whether to board the passengers or not. Leave them comfortably (for the crew at least) in the departure lounge and you take a delay when finally rounding them up and getting them on board; Bring them on and they could end up sitting there for a while until you resolve your problem, or worse, have to offload them again. A replacement CDU was sought firstly from Singapore Airlines, our maintenance contractor and an operator of the same aircraft type. As such we borrowed parts from them regularly, this goes on all the time between the airlines, albeit at exorbitant rates of exchange. Based on the availability of a spare CDU, we boarded the passengers, anticipating only a minimal delay. We were well down the road of the pre-departure dance when the replacement unit arrived at the aircraft. As it turned out, it was not suitable for our aircraft. After some discussion it was decided that we would now need to go with only one serviceable CDU, and therefore dispatch under non-ETOPS rules; we would re-plan the flight to remain near enroute airports. New route, new flight plan, new fuel load, new loadsheet – things were complicating up just nicely. Najeeb on the other hand … had an Algerian passport. Therefore he had a ten minute grilling, several phone calls and two forms to complete each time through. On the last go through – he just sent me! Captain Najeeb insisted that the CDU be swapped from the right (my side) to the left (his). Given that I was the one who would normally do all the FMC-CDU work, I was only mildly miffed by this, figuring that I supposed it made more sense for the Captain to have the CDU rather than the First Officer since the Captain was clearly more important, if not taller, than the First Officer. After instructing the change, Najeeb turned to me in his typically self deprecative way and told me that in the event of a major electrical power failure, only the left CDU would remain powered, thus it was important that this side should be the functional one. Another piece of aviation lore to store in the back of my mind for the future. The impact of dispatching under Non-ETOPS rules meant we had to remain within 60 minutes flight time of an available airport. As you can see from the attached map this severely affected the first half of our journey. 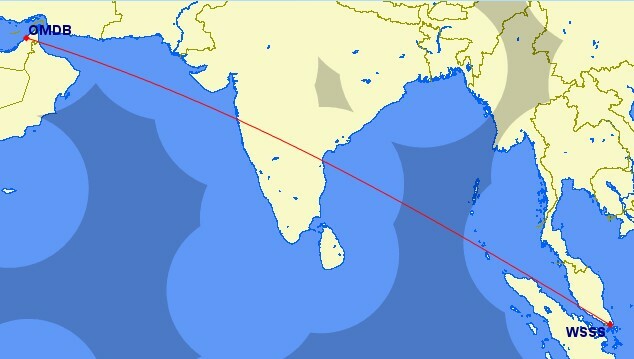 Instead of efficiently heading across the Bay of Bengal we would have to hug the coastline in order to keep within range of adequate airports. This would require a notable increase in fuel required. Fortunately despite a good load of passengers and freight, we had spare load and capacity for the additional fuel requirement. Off the top of our heads we would at least need a new flight plan and a new load sheet – the latter being the result of a computer driven process to make sure the aircraft is not only within legal weight constraints but also in balance without to much weight at the front or rear of the aircraft. Since the new flight plan would determine how much additional fuel was required, we got that request in early, then moved to inform the crew and passengers of the likely delay. Our Singapore engineers moved in to shift the CDU from right to left, requiring us to exit our seats and retire to the cabin. A short time later I was back in my seat, Pancho to Najeeb’s Cisco Kid once again. As I recall we were enjoying coffee and conversation when we heard a crescendo of footsteps from the aerobridge and L1 door, followed by the crashing of the opening flight deck door. In came a local Singaporean gentlemen, talking to Captain Najeeb in highly animated Chinglish, gesticulating wildly. I sat in quiet amusement as these two gentlemen proceeded to completely fail to achive détente, restricted as they were with accented English as a second language on one side and practically no English on the other, and eventually Najeeb headed out the door on the arm of the excited refueller. I continued my coffee in quiet contemplation of the evening’s events, just the beginning of a long night’s flight to Dubai. Even when brand new to the airline, a burden to your trainer as you struggle to keep up with the operation, YOU can make a significant contribution to flight safety! 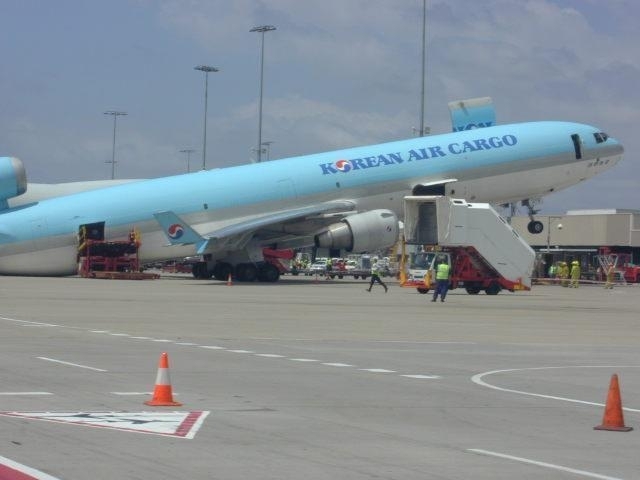 As it turned out, when the new load sheet had come to the cargo loading staff, they realised that they would have to completely re-distribute the cargo load. As the aircraft was refuelled with the stabiliser at the rear of the aircraft, progressively filling with more and more fuel, the load supervisor (a very loose term) realised that all the heavy cargo in the rear of the aircraft would have to be moved to the forward hold, and all the bulky cargo previously loaded in the forward, would have to be moved aft. The first step in this process? Well, clearly to remove all the freight (heavy and otherwise) from the forward hold to make room. And the rest almost became history.